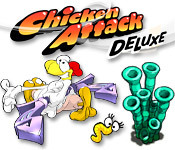 Free Chicken Attack Deluxe download for PC - Full Demo or Buy it now at PopGamers.com! She's back! The crazy chicken from 'Chicken's Revenge' is back on the warpath with vengeance. Defending her chicks in this 'Magic Ball' style game, this mama bird won't put up with any fowl play when she's defending her brood. Non-stop action will put your reflexes to the test as you battle to save the little chicks! Prove your skills as you team up with our heroic hen to defeat a world of crazy guys and evil beasts!